MENDOCINO COUNTY, Calif. (KIEM) – A Mendocino County deputy is in the hospital following a marijuana bust, that may have put him into contact with some toxic, banned chemicals. 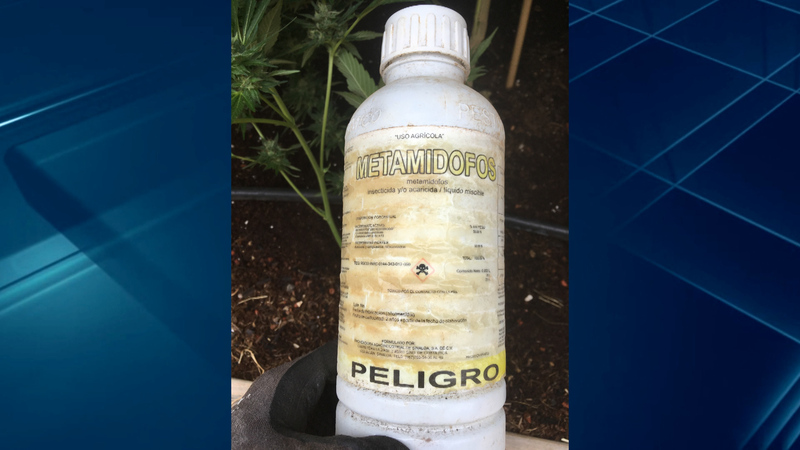 The above image is the bottle of metamidofos the Mendocino County Sheriff’s Office confiscated after the raid of a suspected illegal grow in Branscomb on the on July 13. The pesticide is banned by the Environmental Protection Agency for health hazards — and this bottle was believed to have been brought into the country illegally. The unnamed 36-year-old deputy exposed started experiencing stomach problems, which progressively worsened leading to his hospitalization. The Mendocino County Sheriff’s Office urges other first responders, who think they may come into contact with dangerous pesticides at marijuana grows, to seek medical attention.